On June 27th, Catholic Northeast Family Service Center hosted the 12th Annual Blessing of the summer, where we were joined by Reverend Monsignor Daniel Sullivan. 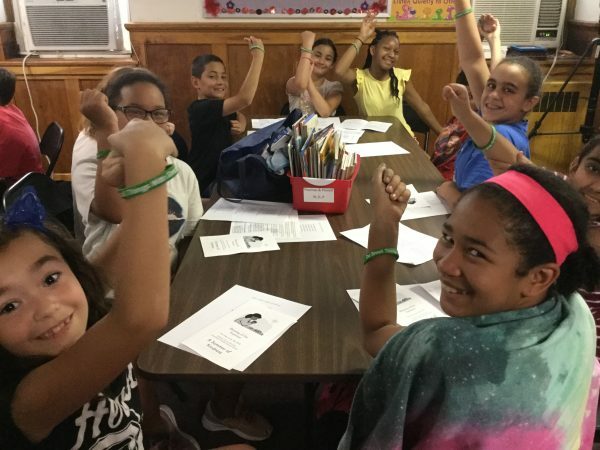 Monsignor Sullivan blessed special kindness bracelets that were then distributed to the children to symbolize a happy, healthy summer ahead to all of the children receiving summer meals at the sites sponsored by NDS. The Summer Meals Program is federally funded and operated nationally by the United States Department of Agriculture (USDA). In our area, it is administered by the Pennsylvania Department of Education. This year the NDS Summer Meals Program runs from June 18 through August 24. This summer, Northeast Philadelphia Family Service Center is one of just over 400 summer meals sites partnering with NDS to provide healthy meals to children. Participating sites offer children aged 18 years or younger, a box lunch and choice of breakfast or snack. Most Philadelphia and many suburban neighborhoods qualify for the program. During the blessing, we enjoyed lunch together which featured an Italian whole wheat sub, apple juice, a romaine salad with cherry tomatoes, and whole grain vanilla bear grahams. Special thanks to Northeast Philadelphia Family Service Center for hosting us and for being such a positive, welcoming group! We are lucky to work with organizations like them that make our Summer Meals Program a success.